Having to never lose any of your chats/messages/whatsapp conversations, etc. Now that we know what kind of memory is vulnerable to being lost, we can think of backing up things stored on it - contacts, accounts, settings, application data, etc. Easy way: When adding a new contact, an often neglected option asks you "Create contact in: Google Account, Phone, or SIM?" If you choose "Google" as the answer to the above (instead of "Phone"), you're done. Over. That contact will be synced to your google account the next time you're connected to internet, and voila! You'll never lose it. Note: Contrary to what some people think, choosing that the contact be saved in Google doesn't mean that the contact won't show up on your phone. 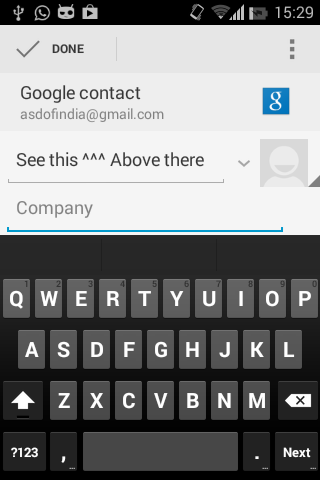 A Google contact acts just like a phone contact, only that it will also be synced to the google server. What about existing contacts on phone? Moving the contacts you've already saved to your phone from your phone to Google is also going to be a piece of cake. Step 1: simply click "from: phone" and "to: google". Most phones I've come across does not have the above "move" option. For these, we're going to take a scary approach. Choose "phone" and it will save all your phone contacts to your SD card. Choose "sim" if you also have some contacts on your sim card. Choose "Google account" when you're prompted where to import contacts to. If you do not ever connect to internet, an alternate way to back up your contacts is to follow steps 1 and 2 above, and then step 4 when you need to restore your contacts. The disadvantage of this approach is that this is manual. Just download Contact Backup apps and these will do the above alternative automatically. It is free, and it works charmingly well, backing up all your SMS conversations to gmail thus allowing you to use gmail's search to search even your SMS conversations. Backs these up to GMail! Whatsapp has a built-in backup feature. By default it is on, and runs at 4 AM every day. It creates a backup of all your chats to the "Whatsapp" folder of your SD card. You can also trigger a manual backup, in case you know you're going to break your phone. Never "Delete and exit group"
After you install whatsapp again, it automatically detects the backup inside "Whatsapp" folder on your phone's SD card, and offers to restore conversations for you. Do NOT choose to continue without restoring. Once you do this, you'll potentially fork your message history thus leaving you with no chance to have a "total" history of your whatsapp messages. Just copy the "Whatsapp" folder and paste it in your SD card BEFORE installing whatsapp. Now, whatsapp automatically detects your backup and restores messages from it. In newer android phones, there is a setting "backup & restore" that allows backup of all settings. But otherwise you'll need different apps. Just search "backup settings" in play store. *Some phones have an external storage that is built-in, or comes with the phone. I haven't played around with this a lot, but chances are that this acts like an SD card.